Despite the increase in the solar cell R&D in recent years involving emerging materials such as perovskites and organics, the inorganic crystalline silicon photovoltaics continue to be the most favored in the solar cell industry. According to Rana Biswas, who is a senior scientist at Ames Laboratory, although thin-film solar cells have numerous benefits, such as lower manufacturing costs, the generally thicker crystalline silicon solar cells are favored due to their long-term stability. Rana Biswas has been analyzing solar cell materials and architectures for nearly 20 years. Crystalline silicon solar cells today account for more than 90 percent of all installations worldwide. The industry is very skeptical that any other material could be as stable as silicon. Biswas, is co-author of a new study that employed supercomputers from the Berkeley Lab’s National Energy Research Scientific Computing Center (NERSC) - a Department of Energy Office of Science User Facility - for evaluating an innovative approach for developing more energy-efficient ultra-thin crystalline silicon solar cells. The thickness of thin-film solar cells generally developed using semiconductor materials (e.g. amorphous silicon) is only 1 µm. Although their lesser thickness renders the manufacture cost of thin-film solar cells inexpensive when compared to crystalline silicon solar cells (having a thickness of about 180 µm), it also renders them less efficient, that is, they have only 12% to 14% energy conversion when compared to almost 25% for silicon solar cells, which converts to nearly 15% to 21% for panels of large area, with respect to their size. The reason is that when the thickness of the solar cell is shorter than the wavelength of the incoming light, the light does not get absorbed. Such a challenge motivated Biswas and colleagues at Ames to find ways to enhance the architectures and efficiencies of ultra-thin silicon cell. 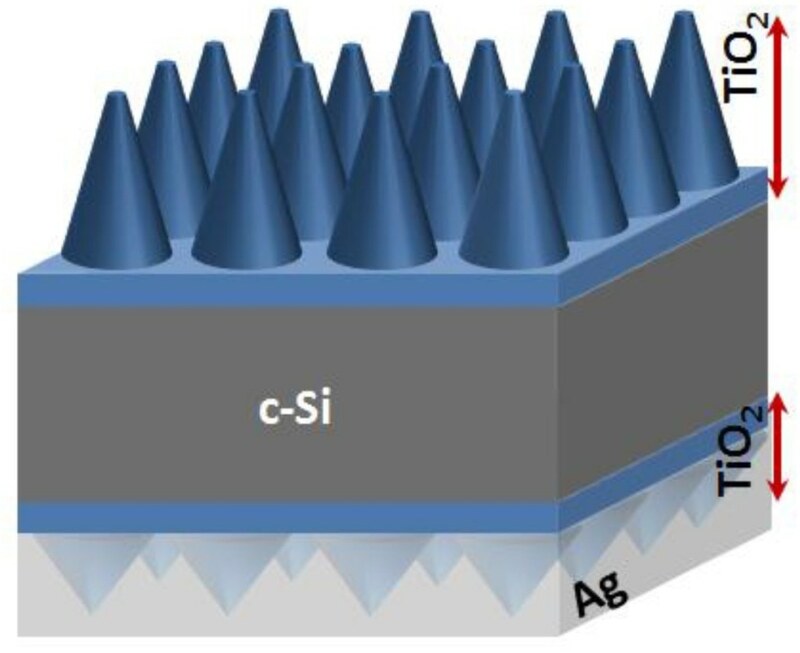 The endeavors of the researchers in developing an ultra-thin crystalline silicon solar cell architecture with improved absorption and light trapping abilities have been reported in a paper published in the journal Nanomaterials. “We were able to design a solar cell with a very thin amount of silicon that could still provide high performance, almost as high performance as the thick silicon being used today,” stated Biswas. The important aspect in overcoming the challenge is the wavelength of trapped light and the nanocone arrays employed to trap it. The solar architecture proposed by the research team includes thin flat spacer titanium dioxide layers on the rear and front surfaces of silicon, nanocone gratings optimized for height and pitch located on both sides, as well as rear cones enclosed by a silver metallic reflector. Then, the team set up a scattering matrix code for simulating the light that passes through the disparate layers, and investigated the manner in which the light gets reflected and transmitted at disparate wavelengths by each of the layers. This is a light-trapping approach that keeps the light, especially the red and long-wavelength infrared light, trapped within the crystalline silicon cell. We did something similar to this with our amorphous silicon cells, but crystalline behaves a little differently. Apart from the unique architecture of the cell, the simulations run by the research team on NERSC’s Edison system employed “homegrown” code created at Ames to model the light through the electric and magnetic fields of the cell, which is a “classical physics approach,” noted Biswas. This enabled the research team to investigate multiple wavelengths to ascertain the most optimum wavelength for trapping light. For optimizing light absorption of the crystalline silicon with respect to the wavelength, the researchers passed light waves with disparate wavelengths into a designed solar cell. They then calculated the light absorption in the architecture of that particular solar cell. The Ames research team had earlier investigated light trapping in other thin-film solar cells developed from amorphous and organic silicon in prior research. One very nice thing about NERSC is that once you set up the problem for light, you can actually send each incoming light wavelength to a different processor (in the supercomputer). We were typically using 128 or 256 wavelengths and could send each of them to a separate processor. Biswas stated that in the future, given that this research concentrated on crystalline silicon solar cells, this new design will be able to make its way into the commercial sector, despite the fact that initial difficulties might occur due to the manufacturing scalability.